75th and Sedgwick: AND THEN I QUIT MY JOB (PART TWO). AND THEN I QUIT MY JOB (PART TWO). Hope you had a great weekend! So, today I thought I'd catch you up on some updates in my life. Much like Deweese did almost exactly a year ago. "Some crazy life altering career change?" "Did this have something to do with turning 30?" "Insert something really deep about taking what I do in my free time and making it my career?" It was definitely a combination of all of these things, but most of all it is a new and exciting job. So needless to say I didn't announce it here on the blog and now here we are. And it showed up in AT's Facebook feed! So it was revealed and at first I was embarrassed and wanted to hide but then it was really exciting and fun. Yes, exactly like that. The bottom line is: I love my new job. It's incredibly fun and there have already been so many creative opportunities like the video above, which has been the most pleasant surprise! Aaaand I get to read Apartment Therapy at work now. What could be better than that? This little video brought a lot of new readers to our site, which is such a great feeling. If you are new and reading this: WELCOME! We are incredibly glad you're here and hoping you stick around and hang out with us for a while. Here's some helpful links to quickly bring you up to speed. Here's a little about us. And here's Deweese's career change story. Get ready to be inspired! We blog about everything. From the Olsen Twins to Pimento Cheese. But, not surprisingly, our most frequent topic is interior design. Here's a link to our interior-design related posts. We have a little off again/on again series called Phone-A-Friend. Read all about it here. Oh and here's my bedroom that I mention in the video above. And finally, just two of my favorite older posts: here and here. Thanks for indulging me and time to get back to business! This week Deweese and I will be sharing our fall fashion wish lists. So basically I will be pinterest-ing over the next few nights!! PS: Don't forget, Readers! You heard about my painted door way before it appeared on AT! Read that little post, here! 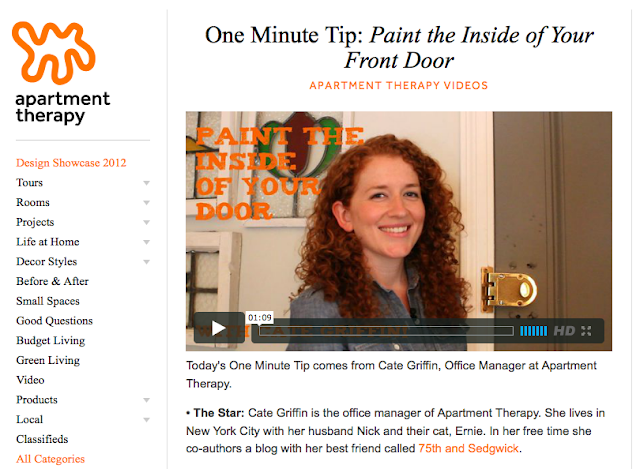 Great video on Apartment Therapy! !